Wade Cambern and Hawaiian Style Band entered the Hawai'i recording industry in 1991 with a new contemporary sound in their Nā Hōkū Hanohano award winning Single of the Year, Live A Little, Hawaiian Style. With co-producer Bryan Kessler, lead singer and songwriter Wade Cambern continued to develop a collaborative and uniquely evolving musical entity, performing and recording with talent such as Israel Kamakawiwo'ole, Teresa Bright, Robi Kahakalau and Fiji. Hawaiian Style Band’s first CD release, Vanishing Treasures, won the 1993 Nā Hōkū Hanohano Award for Contemporary Album of the Year. In 1995, the group’s collaboration with Martin Pahinui, Michael Ruff, and others earned Hawaiian Style Band the Nā Hōkū Hanohano Island Contemporary Album of the Year Award for Rhythm of the Ocean. The group pursued new creative inspiration with featured artist and kumu hula Keali'i Reichel in its third album, Ohana, which was nominated for the Nā Hōkū Hanohano Island Contemporary Album of the Year in 1996. Continuing in the Hawaiian Style Band tradition of nurturing the synergy of established musicians and unknown artists, co-producers Wade Cambern and Garin Poliahuʻs latest project Hānau hou garnered three Nā Hōkū Hanohano nominations in 2015. 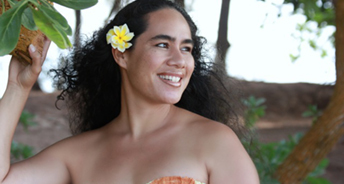 Kainani Kahaunaele is a multiple Na Hoku award winning singer-songwriter. Kainani Kahaunaele was raised by her grandparents in the rural community of Anahola, Kauaʻi surrounded by four generations of musical talent. Her love for Hawaiian music was infused at an early age, playing ʻukulele and harmonizing with her Kahaunaele, Pānui and Kaluahine families. Whether in church, on stage with the Kapaʻa High School Show Choir, at the backyard jam, or at the lūʻau, she was unknowingly in training as she was destined to share the music of her ancestors, her culture, and practices with a more global audience. While earning her B.A. in Hawaiian Studies with an emphasis in Hawaiian language at UH Hilo, this talented songstress started singing professionally and composing traditional songs (haku mele) as Hawaiian language curriculum for ʻAha Pūnana Leo (a pioneering Hawaiian language revitalization program) that encouraged and promoted the documentation of our history through mele while also earning several Nā Hōkū Hanohano Awards along the way. In the field of solo ‘ukulele playing, the number of recording artists who specialize in jazz can be counted on one hand. Bill Tapia and Lyle Ritz are two names that immediately come to mind. Now with this historic CD, Benny Chong’s name can be officially added to that “endangered” list. Benny taught himself to play the ‘ukulele when he was about 11 years old. After nine years or so, he virtually put the ‘ukulele away for some thirty-five years. When I met him in 1964, he was the guitarist with the Ali’is, the band that backed up Don Ho. In 2000, I invited him to be one of the four artists in “The Art of Solo ‘Ukulele”, a concert series that led to a CD and a public TV special. 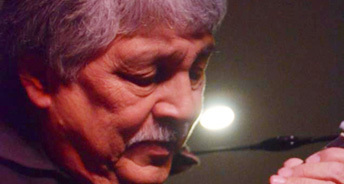 These events revitalized his interest in the ‘ukulele, resulting in his debut album Ukulele Jazz. 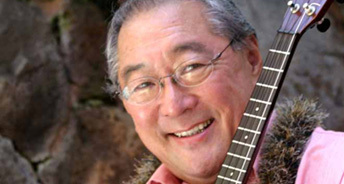 Byron Yasui taught himself to play the ‘ukulele when he was 13 years old. He played it for recreation from 1953 to 1960, then put it aside when he started college and became a string bassist. In 1998, the ‘Ukulele Hall of Fame Museum invited him to be one of the four ‘ukulele soloists in a four city concert tour on the east coast. 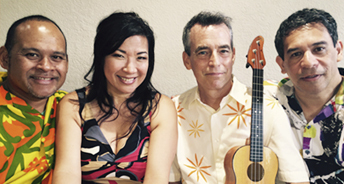 In 2000, he was asked to put on and play in a series of concerts featuring four ‘ukulele soloists, which he called “The Art of Solo ‘Ukulele.” He was a featured soloist in many ‘ukulele festivals throughout the U.S. and in two Honolulu Symphony Pops concerts. He has also given ‘ukulele clinics and private lessons at various festivals and gatherings, including those in Portland (Oregon), Bethesda (Maryland), Indianapolis (Indiana), Plano (Texas), Santa Cruz (California), ‘Ukulele Hall of Fame Museum Expositions in New Jersey and Rhode Island, and three of Keola Beamer’s Aloha Music Camps on Moloka’i. In 2006, he released his solo ‘ukulele CD, “Anahola”. 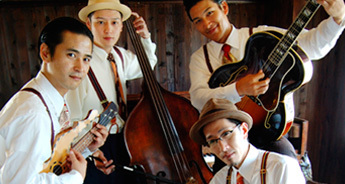 Sweet Hollywaiians are based in Osaka,Japan.They were originally street musicians who share a common passion of Hawaiian, Swing, Ragtime, Blues, Calypso and Italian for the 1920s~1930s string band tradition in collecting the music of long forgotten legends like Sol Hoopii, King Bennie Nawahi, Roy Smeck and Eddie Lang. This string quartet containing a dozen of string instruments like a Hawaiian steel guitar ( a lap steel guitar), banjo, tipple, ukulele, mandolin, a bass and guitars. Most of the members are multi-instrumentalist and they change their instruments song by song. Since they founded their band in 2002, so far they have released seven albums. And they have gone to many over sea live performances and earn the great reputations from the audiences in the U.S.A, Canada, France, Belgium, Netherlands, Germany, Australia and of course Japan.